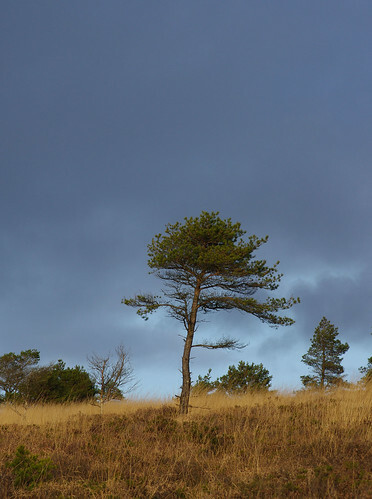 Ideford Common is situated at the top of Haldon Hill, on the lesser known Eastern side. On arrival I improvise a looping route around the heath, taking in some of the surrounding lanes and villages and saving the common till last. From the car park, we find the muddy, waterlogged track we need: heading in a northerly direction and back towards the approach road. On one side there are tubular Cladonia lichens. The peaty soil is ideal for mosses we might not see in Torbay so we are keeping our eyes keenly peeled. It soon becomes clear, however that the usual problem applies. In recent weeks I have made a significant breakthrough. 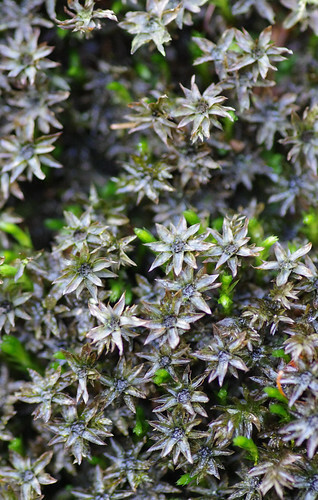 I can recognise a type of moss now but am still unable to narrow the search to individual species. 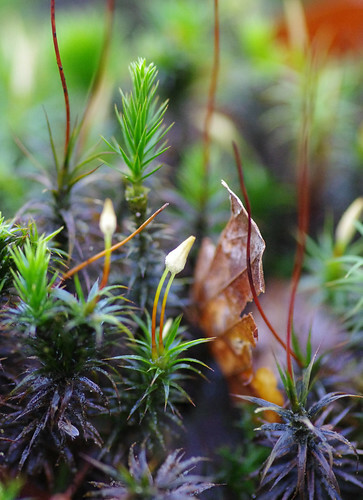 This could be Dwarf Haircap (Polytrichum aloides). 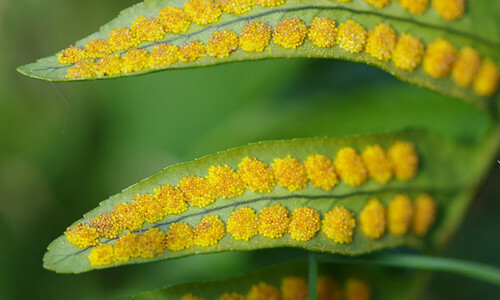 The photographs in the field guide show a starry rosette of glossy green leaves. For some reason the examples here have a burnt look. They were growing inside a hedgebank under trees so it is highly unlikely that this area of ground has been burned. This is more likely to be Southern Bracket than the virtually identical Artist's Bracket. The former is the most common of the two species, while the latter sometimes possesses warts underneath. 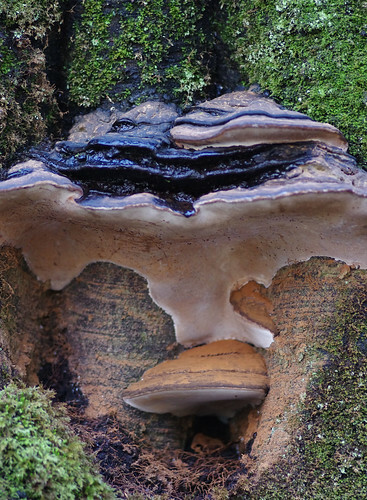 Both species are found on the lower trunks of trees, are concentrically tiered above and exhibit a cocoa-like dusting on their lower regions. 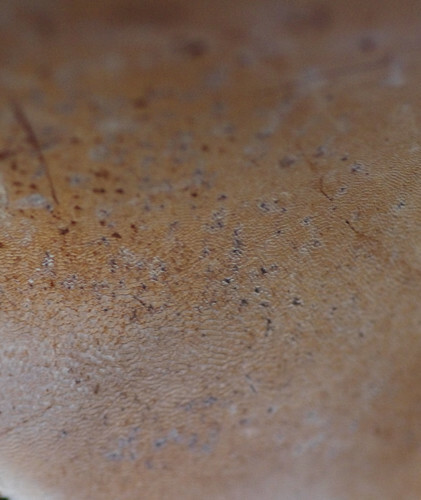 And this was how it looked on the underside - a bit like the skin of a bongo to my way of thinking. Further along the lane there were lots of different mosses to investigate. Unfortunately the camera's autofocus system could not cope. There was literally too much in the frame to acquire precise detail in every part of the picture. 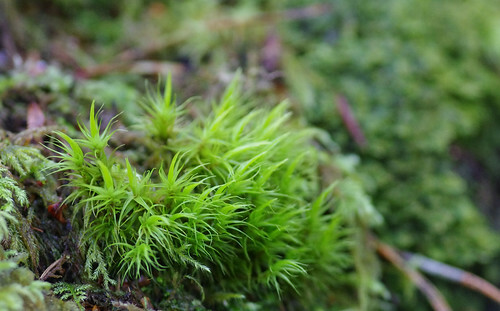 The above picture appears to be another Haircap species of moss. The fruits and stalks (also called seta) are unusual in this case, being situated ascending from the top of the leaves, not separate from them at the base. The stalks in the background are considerably more statuesque which only complicates matters further. Some of the leaves have a burnt look again or as if they have suffered an oil spillage. 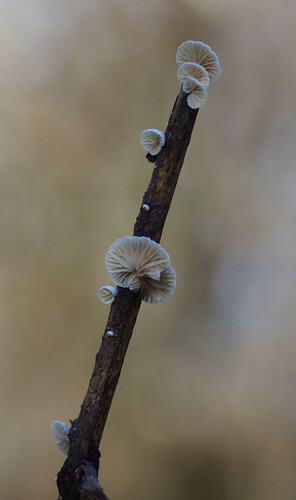 With lots of fallen twigs and branches around it was only a matter of time before we saw crust fungi. At first I thought this might be Wrinkled Crust but when checking through the splendid photographs in Roger Phillips's Mushrooms I found a perfect match. 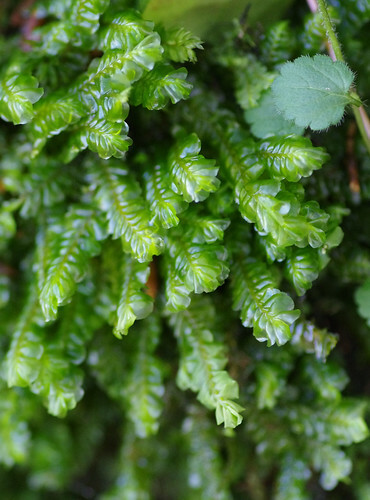 This had convex leaves and we wondered whether that factor alone would be enough to aid identification (there being over 200 liverwort species in the UK.) But magnified on the monitor we found tiny teeth on the margins of the leaves and were able to reach a decision. We continued our measured descent of the hill which took us past a Norman sandstone church and into the hamlet of Ashcombe. At the crossroads we took the lane to the right, running initially parallel to a stream named 'Dawlish Water' on the map. Presumably this watercourse heads into Dawlish itself and might empty into the sea. We will have to have follow it on another expedition. But for now, necessity intervened and made us bid it farewell. In two hours of hedgerow examination I don't think we had covered much more than a mile. At the next junction we headed right down into Milton Mill. There was the almost scrumpy-tang of sileage in the air and we passed a farmer splitting logs, before continuing through a loose complex of holiday cottages and up the hill. After more incessant heavy rain I feared a lane would be flooded. Sure enough, the road ahead was severely waterlogged but it was too late to turn back and take a lengthy detour round. I marched through in my leather boots, Lady trotted along as if it was her birthday and Sherry followed effortlessly behind. But our companions were not so lucky. Mick Watson's suede boots got soaked while Linda's trainers developed internal puddles of their own. I uttered an embarrassed apology and thought it best to press on. I found this fallen, rotting twig in the hedge and retrieved it then held it up to the light. Further up the lane we found another twig. Our hill zigzagged its merry way up and we traipsed along following. At the top we crossed the main road at Colley Lane Cross and plunged down another hill, keeping our collective eyes peeled for fungal forms. We found this in the soggy leaf litter. 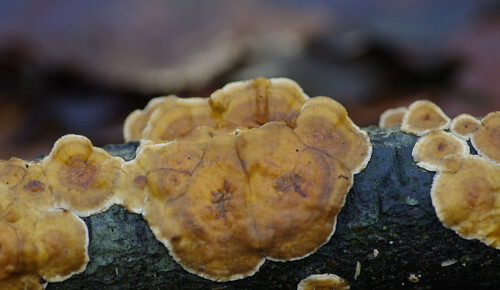 There were gills underneath and a distinctive veined pattern on the top. 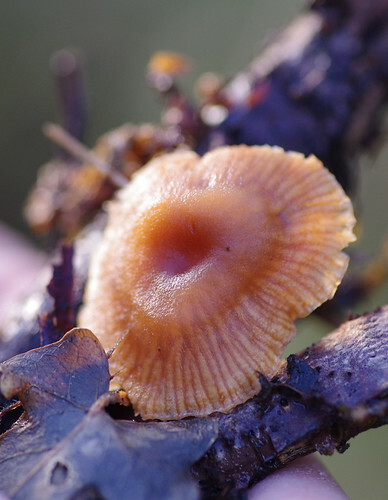 To my eyes it looks most like Star Pinkgill (Entoloma conferendum). But that species is found on lawns. There is no mention anywhere of hedgerows. Scurfy Twiglet might also fit the bill - were it not for the inverted 'v' pattern of the veins. In the village of Luton we found a bench for four and had lunch. There was a clear, cold stream with a concrete ramp: ideal for the Lady to be washed clean. Two ladies on horseback approached and backed away. I thought perhaps the horses were afraid of getting their feet wet. The riders said they were afraid of people. We readied ourselves to move but they insisted on riding around the other away and left. The horses looked relieved as they turned away. At Luton Cross we went left then right shortly thereafter and down into Ideford. By the Royal Oak pub we took another right and then by the village church on the corner went left up Bowdens Lane. 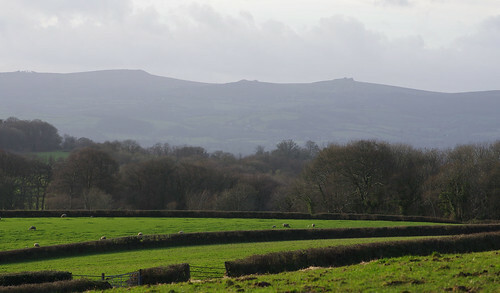 Such is the nature of the Devon landscape that you don't have to go far before Dartmoor dominates the view. There is always something majestic in watching cloud forms sweep across the tors. I often feel a yearning to go there at once but sometimes I am content to wander the rolling fields and hills in between. The green patchwork with its hedgerow stitching has a majesty all of its own. 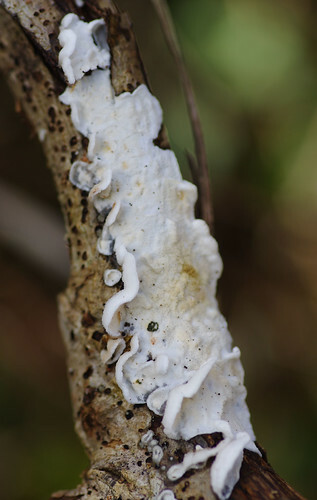 The circular spores known as sori help distinguish this species from its two other close relatives. 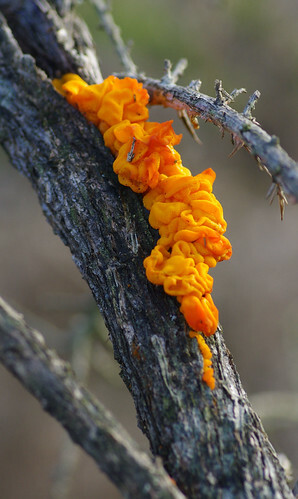 The spores should not be touched when ripe. We were walking up a fairly steep winding hill and I was beginning to wonder if I had chosen the best route back. At the time I thought these were marjoram leaves. I tore off a strip and chewed, only to find it did not contain much flavour. 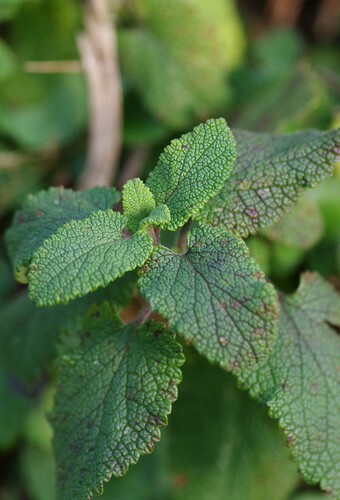 If this is a herb I can fully understand why it would be chopped and dried and not eaten fresh. As we were walking up the hill my heart sank. There were a group of caravans in the distance, on one side of the path. I told myself everything would be alright and there was safety in numbers. Five minutes later we walked into what I can only describe as a scene from a Channel Four documentary. There were fires burning in metal drums. A barking German Shepherd strained on a metal leash and the leash looked liable to break. Lady kept her head and ears down and wanted more than anything to acccelerate. A youth stood ahead in the middle of the path, flanked by two girls and a quad bike. For an awful moment I thought things were heading for a confrontation. But when I said 'hello' he only asked if we had come from the bottom of the hill. We agreed it was a long way and passed by peacefully. 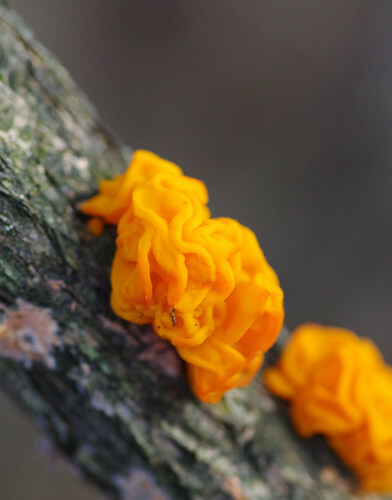 These two fine specimens were found on the branches of European Gorse bushes. The peaty soil of Ideford Common was waterlogged but we found a way through. I checked the map more times than I should have done, not wishing to get stranded. I love the light in this image. 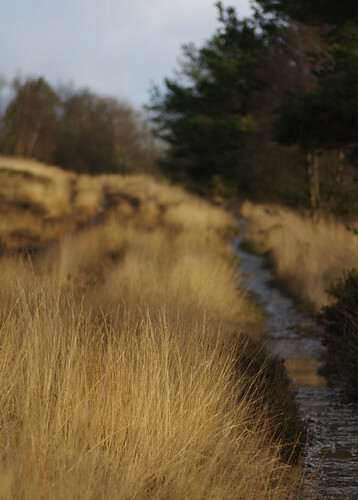 We followed the path on the right and looked back to appreciate the heathland habitat in all its glory. A lot of photographers use graduated filters to darken the sky and achieve this effect. Sometimes the changing conditions can produce these results naturally. Though there are other trees in the background I think the lone pine tree in the foreground gives this image a sense of isolation. 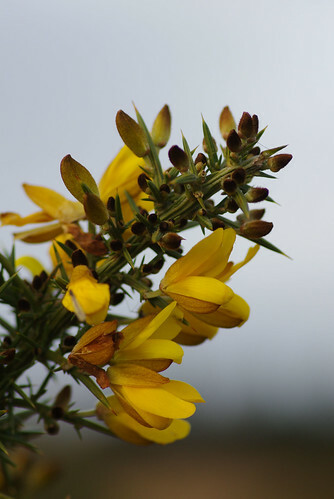 Over the past few months I have stumbled hopelessly when it comes to telling the different gorse species apart. 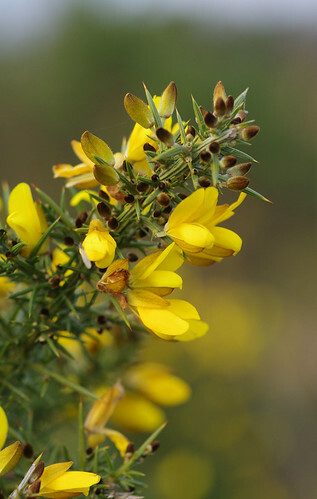 At last we have captured some definitive images of European Gorse. This species is considerably taller than its relatives and more tree-like. We were on the final leg of our journey, along a long straight lane with impressive views of the moor to our left and hazy sandstone cliffs of Dawlish below to our right. 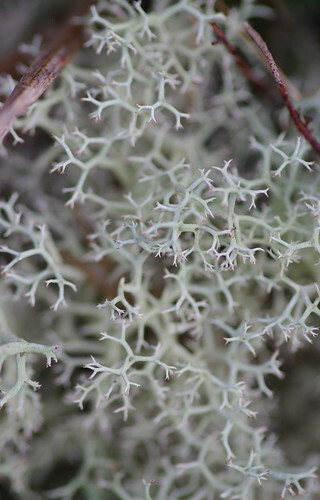 And down among rusty bracken stems, there were these Cladonia lichens. We found this within sight of the car park. Another new species provided the perfect end to the day's adventures. Should you wish to follow our route I would advise taking Ordnance Survey Explorer Map 110: Torquay and Dawlish. Our thanks (and humble apologies for the wet feet) go to to Linda and Mick Watson for joining us on this expedition.